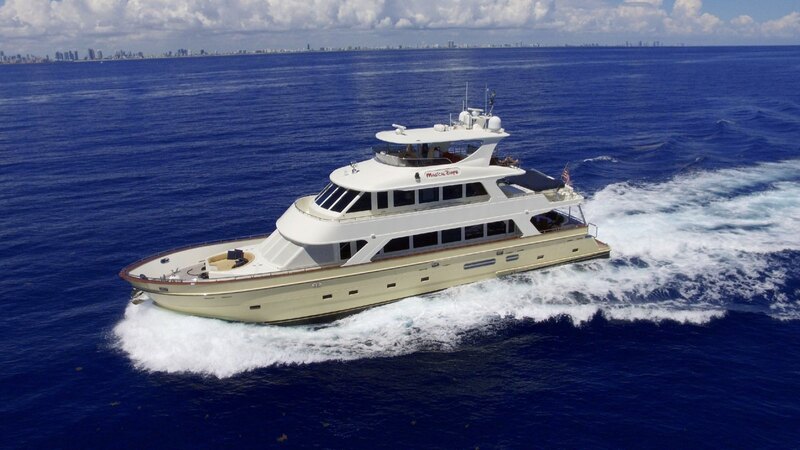 Magical Days was built by President Yachts in 2007 with a refit in 2013 and boasts more volume on three decks not normally found in the 87’/26.5m size range. The benefits of the additional space on board makes Magical Days an impressive and rare find on the charter market today. She offers full walk around decks on two levels, plus various outdoor seating and dining options. Magical Days can accomodate six guests in three cabins including a full beam master, queen VIP and one twin, all with ensuite facilities and full entertainment systems. The interior boasts large wraparound windows, beautiful woodwork, and elegant furnishings. Ideal spaces for entertainment on three decks welcome guests to relax on the aft deck in the warm breeze with a fresh gourmet lunch, sunbathe on the upper deck, or chill out in the skylounge with 360 degree views. The choices are endless for a magical charter on board. Designed to cruise in warm waters, Magical Days has two main al fresco dining spaces forward and aft, with wide walk arounds decks ensuring easy movement between all exterior spaces. A circular lounging area on the bow is the perfect place to gather and sunbathe, or enjoy cocktails and canapes as the sun sets. The two main guest spaces are a large main salon, with wraparound windows that flood the space with light, timeless styling, beautiful woods and luxury furnishings. A formal dining space leads directly to the full beam galley, where the onboard chef will create a custom charter menu to delight the senses. This space also doubles as a bar area or breakfast nook. Moving upwards the skylounge is a second, more relaxed interior guest space that provides a wet bar, mini-kitchen, leather seating, and full entertainment and wrap-around views. Magical Days is a rare find. Her space, volume, and amenities are easily compared to larger charter vessels on today’s charter market. The benefits of the added volume and full walk around decks on two levels is certainly impressive for her size. Magical Days is the perfect size for families, couples or smaller groups ready for a magical charter to remember! Step on board luxury charter yacht Magical Days and take a 360° tour of this impressive President.